Thematically adventurous...the bloody shocks that paint the town Red emerge from suburban squalor: dirty streets, dirty crimes, and dirty politicians. 308 min. IFC Films. Directors: Julian Jarrold, James Marsh, Anand Tucker. Cast: Sean Bean, Rebecca Hall, Peter Mullan, Mark Addy, Warren Clarke, Andrew Garfield, David Morrissey, Eddie Marsan, Paddy Considine, Jim Carter, Daniel Mays. Think of a television event set in Yorkshire. If you're American, chances are that you can't, or if you can, what comes to mind is the gentle veterinarian dramedy All Creatures Great and Small, set in the Yorkshire Dales. But last year's thematically adventurous Red Riding trilogy—developed for the UK's Channel 4—paints Yorkshire's West Riding region in dark shades. No "miracle of life" countryside calf births here; here, the bloody shocks that paint the town Red emerge from suburban squalor: dirty streets, dirty crimes, and dirty politicians. It's no stretch to see echoes of grim fairy tales in Red Riding, with the predatory Yorkshire Ripper on the loose and child abductions among the terrifying crimes. Exhibited theatrically in the US both as individual films and in a five-hour "Roadshow" presentation the series of three interrelated telefilms derive from an acclaimed quartet of Red Riding novels by David Peace: Nineteen Seventy-Four (1999), Nineteen Seventy-Seven (2000), Nineteen Eighty (2001) and Nineteen Eighty-Three (2002). Reshaped into a trilogy by producer Andrew Eaton, each chapter is helmed by a different director in a distinct style. 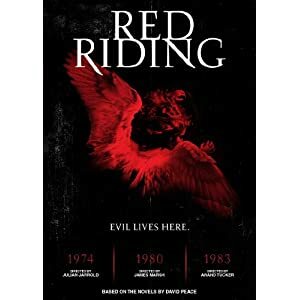 Red Riding: In the Year of Our Lord 1974, directed by Julian Jarrold, unfolds in the near-maximum grit of 16mm. James Marsh shot Red Riding: In the Year of Our Lord 1980 in 35mm, and Anand Tucker's Red Riding: In the Year of Our Lord 1983 gets a smoother sheen from the state-of-the-art digital RED camera. The gambit helps to make the period progression palpable, allows the filmmakers some room for visual play, and perhaps teases the subconscious with the hopeful but ironic suggestion of a timeline moving toward order and resolution. Top British acting talent participates, including Sean Bean, Peter Mullan, and Eddie Marsan, all of whom appear in more than one entry. In 1974, a ten-year-old girl named Clare, last seen in a red anorak, has gone missing. Like Neil Jordan's The Company of Wolves, this little-girl-lost tale evokes Little Red Riding Hood's tentative journey through dark woods, redefined by Jarrod as the obscuring smoke, mists and clouds of West Riding. Before long, Clare turns up tortured, raped, and strangled, which complicates twin investigations by the West Yorkshire Police and the Yorkshire Post. 1974 is told from the point of view of callow crime reporter Eddie Dunford (Spider-Man-to-be Andrew Garfield), whose determination and raw talent propel him down a rabbit hole where he is threatened by cops and entangles himself in an ill-advised romance with a woman (Rebecca Hall of Vicki Christina Barcelona) whose daughter spirited away two years earlier. Cigarettes, leather jackets, bell-bottoms, and dollops of pop music establish the socially agreed upon distractions of the particular bygone time: just a few ways of avoiding ugly truths. This first film establishes the most germane of these truths, told in Yorkshire dialect: "Devil triumphs when good men do nowt." 1980 belongs to the Yorkshire Ripper. Aside from the ongoing criminal mystery and obstruction of powerful men, it's a tale of dreary duty, seen from the perspective of the Manchester Police's Assistant Chief Constable Peter Hunter (Paddy Considine of In America). The career cop's bosses make his advancement contingent on accepting a job no one would want: a secret internal-affairs inquiry into the West Yorkshire Police's Ripper investigation. At every turn, Hunter encounters embarrassments, stonewalling, and cover-ups that contribute to the force's inability to fulfill its duty to the public. Should Hunter choose to challenge the status quo, he would, of course, put himself into the sights of those who stand to lose a lifetime of ill-gotten gains. The second film's signature line comes from Hunter: "How deep does the rot go, Maurice? Eh? How deep? And who stops it?" After a reporter and a cop, 1983 shifts to an unlikely hero: a slovenly solicitor named John Piggott (Mark Addy of The Full Monty). A ten-year-old girl has disappeared, re-opening West Riding's old wounds. A "soul man" in his musical taste and, as it turns out, his personality, Piggott is twice sought to help men accused of murder, and twice has no recourse to do anything but bear witness to their fate. Piggott has felt helpless for most of his life (a condition stemming from a family tragedy), but fate has conspired to give him a shot at redemption. Meanwhile, the police—some employing methods that include outright torture—write their own narrative. Detective Chief Superintendent Maurice Jobson (David Morrissey)—a.k.a. "The Owl"—has always played along, as we've seen since 1974. But when the long-elusive "Wolf" comes into focus, all bets are off. The film's defining line has echoed through the trilogy: "To the north—where we do what we want." MPI's two-disc set for Red Riding on Blu-ray includes a feature disc squeezing the trilogy's 308 minutes onto a BD-50 and a DVD housing the bonus features. Happily for viewers, the image quality is excellent in its faithfulness to the source material, intentionally ugly though it may be at times. The film's varying film stocks and digital source result in three very different looking pictures. The first two films retain their film-like appearance, with 1980 looking roughly twice as sharp as the 16mm-shot 1974. The last film has a sort of digital sheen to it but also by its nature the greatest hi-def fidelity. All around, viewers should be very pleased by the faithful treatment given to the films on Blu-ray. Audio, on the other hand, is lossy Dolby Digital 5.1; it's certainly functional, but with those Yorkshire dialects, every bit of sonic fidelity helps. Disc Two houses the bonus features. For 1974, there's a "TV Spot" (1:02, SD), nicely done "Julian Jarrold Interview" (11:25, SD), and two "Deleted Scenes" (7:11, SD). For 1980, you'll find a "TV Spot" (1:02, SD); "Making Of" (18:46, SD) with raw B-roll footage and interviews with Paddy Considine, writer Tony Grisoni, director James Marsh, executive producer Andrew Eaton, director of photography Igor Martinovic, production designer Tomas Burton, and Joseph Mawle; and five "Deleted Scenes" (6:49, SD). For 1983, there's a "TV Spot" (1:02, SD); brief "Making Of" (6:41, SD) with Eaton, hair & makeup designer Tahira Herold, producer Alison Dominitz, and Mark Addy; and eight "Deleted Scenes" (8:09, SD). Lastly, there's a section for the Trilogy, with "Theatrical Trailer" (2:29, SD), "TV Spot" (:32, SD), and a short "Behind the Scenes" (3:02, SD) promo with Grisoni, Jarrold, Marsh and Eaton. All site content © 2000-2019 Peter Canavese. Page generated at 04/24/2019 03:24:26PM.